Google – The leader in SEARCH is now becoming the leader in BOOKING! Be one of the first to take advantage of this online booking opportunity. It’s now possible to book appointments at spas and salons across the U.S. on Google. It’s true! 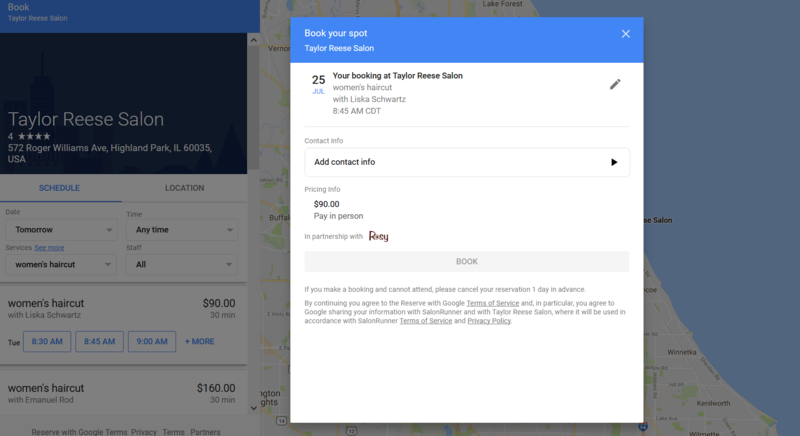 Reserve with Google just rolled out the second phase in its pilot program and, as a select booking partner, Rosy is offering the service in conjunction with our Online Client Scheduling features. Now with a click of a button, a Google user will be able to book your services directly through Google Search and Google Maps. So, it looks like more bookings are coming your way! Q: Is this going to cost me anything? A: No, this is included for free as part of your monthly service with Rosy. Q: What type of service can customers sign up for? A: Any services that you have designated as “Show Online” will be provided to Google. Q: Do I have to do anything to make this happen? A: If your salon or spa uses Rosy’s Online Client Scheduling (OCS) feature, we will automatically turn this feature on for you. Q: What if I don’t want my business to be accessible to Google users? Q: What if we have not set up Online Client Scheduling yet? As always, we’ll keep pushing to find new ways to add value to your business. Rosy is always looking for ways to help you grow your business and this new experience will help bring more clients to your salon or spa. If you have any feedback or ideas on how we can work with Google to improve this experience, we’d love to hear it! In the meantime, thank you for choosing Rosy! I tried the test link and my salon does not show up. Can you tell me what I need to do? What’s the cost of this software to the Salon. Sometimes right after setting this feature up, your business does not show up on Google right away. It takes Google a little time to process. Try back a little later. If you are still having issues, open a ticket at support@salonrunner.com or reach out to your account manager and we’ll take a look at your settings.